We first looked at the Enermax Revolution during Computex last year, where we sat down with a few engineers to see what was coming. It looked good, although at the time debating a name change from the very popular Galaxy (DXX) series seemed a bit like commercial suicide. Along came September and we got hold of a pre-production unit: Revolution insides, but Pro/Modu casing. Testing this early (golden) sample we could see it was potentially special, but hesitated at drawing firm conclusions until we could get our hands on a retail model everyone would buy, and hoped for an accessible price. 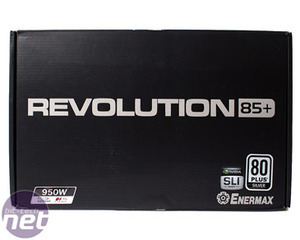 Also coming to light was the "85+" moniker - evolving from the Pro/Modu 82+ launched earlier in 2008, this is something we still think is a negative association for Enermax, especially once you see the results. The Revolution was later released in last December with an industrialised hardwearing new style, and as one of the first high powered PSU's to be awarded the 80Plus Silver badge. Before writing this article we've invested some time playing with the capability of the Reovlution: we've recently been using two of them in the labs, this 950W and a 1,050W model for James Gorbold's upcoming feature on Folding@Home. Having squeezed six XFX GeForce 9600 GSOs into a Core i7 system based around an Asus workstation motherboard, powered by the 950W, and FOUR GeForce GTX 295s into another AMD system using the 1,050W Revolution, both worked flawlessly 24/7. The GTX 295 system was pulling a consistent 950W from the wall, which subsequently turned our labs into a 30ºC Sauna for good measure. That was very impressive, but there still needed to be the review to discover the ins and outs, and find out whether it's good value or not. 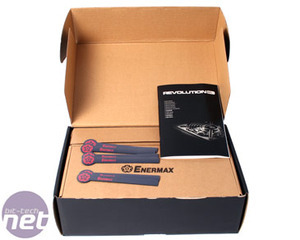 While Enermax caters for all the way up to 1,250W with the Revolution series, we feel the lower, yet still significant 950W of power is more attuned to our readers' needs (and wallets). The box is a simple black number, while inside two cardboard boxes separate the extra cables from the PSU. Somewhat surprisingly, the PSU isn't cased in a bucket load of foam like the Seasonic M12D or Cooler Master UCP series. While plain and simple, it looses a bit of the special feeling when you come to open it up. Also in the box are several, reusable Velcro cable ties, as well as a Revolution 85+ multilingual booklet that has just seven pages of basic, but useful information for each language. There are no more additions for advanced users like typical ripple, efficiency and noise ratings, or even (if you care), a personally tested and verified certificate like the Antec Signature or PC Power and Cooling TurboCool range. Not that we claim the hand testing is worth paying more for, but as an enthusiast buying the best model from a company whose history is in power supplies, we'd expected something a bit more.